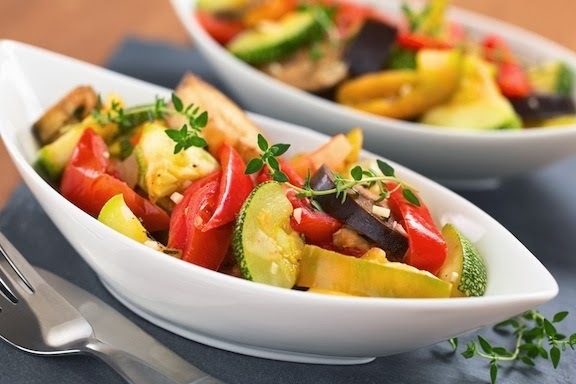 This recipe uses far less oil than a traditional ratatouille recipe. Serve chilled in the summer months, and serve warm on cold nights. Leftovers freeze well. 1. Cut eggplant into ¾-inch cubes. Place eggplant in colander, sprinkle with salt, and cover with bowl. Let stand for ½ hour. 2. In large skillet, heat 1 tsp. oil over medium-high heat. Add onions and bell peppers and sauté 5 minutes. Add garlic and tomatoes and sauté 3 minutes. Remove mixture from pan and set aside. 3. Heat remaining oil and add zucchini to skillet. Sauté on medium-high heat for about 7 minutes. Remove zucchini and place with other vegetables. 4. Quickly rinse salt from eggplant. Dry with paper toweling. Spray clean skillet with nonstick spray. Sauté eggplant on medium heat for about 1 minute. 5. Add reserved vegetables to eggplant. Stir in thyme, oregano, black pepper and cayenne pepper, if using, and cook for 5 minutes. Serve.